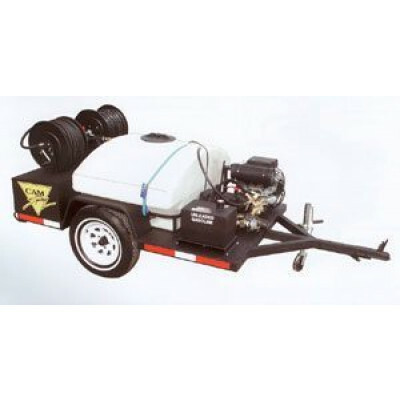 This 3500 PSI drain jetter is mounted on a trailer that carries a 150 gallon water tank. The 3500 lb. axle comes with 14" tires to carry the full load of water, jetter and accessories. If you're looking for something with a higher flow rate, we also offer a 11 GPM Honda powered drain jetter in our trailer mounted drain jetters section. Gearbox drive triplex plunger pump with ceramic plungers and stainless valves. 3500 PSI pump comes with a power pulse feature, adjustable pressure, chemical injection, hour meter, pressure gauge and thermal relief. Electric start engines with low oil shutdown and remote mount throttle. Pump handles fluids up to 160 degrees and is protected with a 80 mesh strainer. 3500 pound rated trailer with a powder coat finish. Trailer is equipped with a 300' hose on a manual reel, 150 gallon water tank and lockable tool/storage boxes. Float switch to shut down machine when tank is empty. Tool box with gloves, face shield, nozzle kit, nozzle cleaner and safety vest. This is a review for the 3500 PSI 150 gallon Drain Jetter.